Last Wednesday, the 20th November, saw the History of Art careers afternoon. 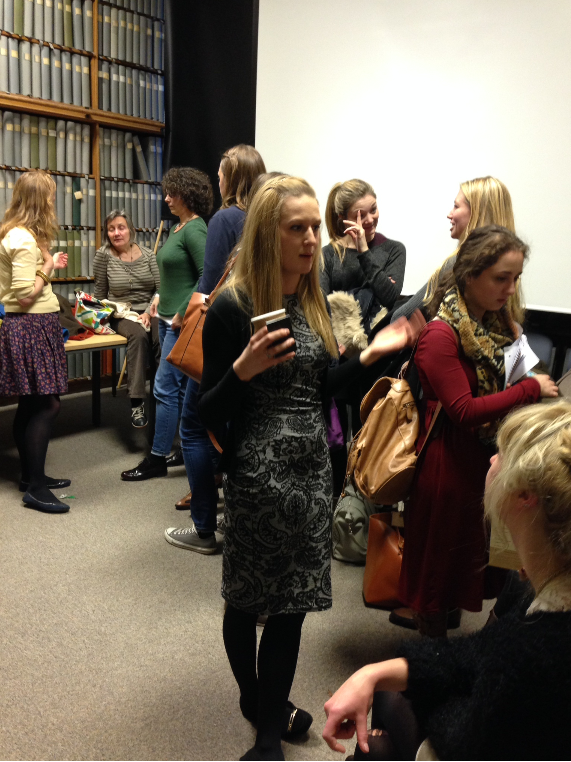 Current students like myself were invited to listen to a series of talks from UoB Art History alumni. These were Edwina Mileham, who now works at the Wallace Collection in London, Katie Hall, who is now at the BMAG, Carrie Woodrow, who works at the Sotheby’s Institute, Kaylee Jenkinson who works for Manchester’s Craft and Design Centre, and, finally, the dynamic Matt Carey-Williams, who graduated in the 1990s with a degree in English and the History of Art and is now the sales director at the White Cube Gallery in London. As well as all of that, there was also an opportunity to have a more informal chat over tea and biscuits. As a final year student I was extremely pleased to hear that there was a careers event taking place. I found the talks generally very informative and they addressed a wide range of sectors in the world of art and culture, showing that there really are lots of opportunities out there for graduates with a degree in Art History from Birmingham. Edwina Mileham from the Wallace gave a good overview of the different sections of a museum, which gave me a new perspective on the types of jobs that are available. I’d never really considered the role of fundraising in museums, for example. Katie Hall meanwhile gave some useful tips about the different opportunities that are available at the University of Birmingham itself, which I had not really heard about before. These include the Research and Cultural Collections, which offers loads of opportunities for students to get involved, as well as the Cultural Internship scheme. The latter of these offers successful applicants a six-month paid placement with a leading cultural institution in the West Midlands region (and you can read about Art History student Lauren Dudley’s Cultural Internship placement with the BMAG here!). Other useful tips came from Kaylee Jenkinson from the Manchester Craft and Design Centre, who told us all about her vast range of volunteering experience and its relevance to securing work in the arts sector. I think I will definitely follow her advice to document everything that you get up to as a volunteer, as a student and beyond, because it makes filling-out applications in the future that little bit easier! Carrie Woodrow from the Sotheby’s Institute gave me an insight into the internship process and how it can set you in good stead for the next post that comes up. She also gave us some good websites for finding internships in the arts sector such as Ideas Tap. The final speaker, Matt Carey-Williams from the White Cube Gallery gave us a humorous and often warts-and-all style account of finding a career in the arts. Even though I do not want to go into a career at an auction house or a commercial gallery–although it does sound remarkably glamorous and exiting–, I was still able to draw some general advice from the talk. For example, he specified some of the best skills to demonstrate in an application, such as a keen willingness to work and determination, and conversely, what to avoid: “I do not need you to tell me that you have been complemented on your ability to exercise common sense . . .”, he says (half-jokingly, half-seriously, I think). In all, I found the Careers event really helpful in matching my thoughts on careers to the reality of careers the art world. There were some great tips from the inside and over an informal chat I was able to get some great personal guidance.